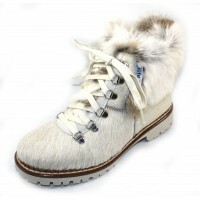 Waterproof hiking bootie with genuine shearling collar. Shearling linings and shearling covered insole. Rubber lug sole. 1 1/4 inch heel. Welt construction. Masters of design and warmth. Pajar is a family owned company with a rich history that has developed its techniques and procedures in shoe crafting as it grew and matured. Very proud of our tradition and heritage, Pajar has incorporated this history into the innovative styles and designs of the footwear, apparel and accessories we have the pleasure to provide today. Our primary aim is to develop and provide comfortable, yet fashionable footwear and apparel using the knowledge acquired through over five generations of shoe-making. Our designers and line builders are continually inspired by our Canadian heritage and work constantly to provide new and innovative ways to produce our product at the highest quality level. Pajar always strives to provide our customers with the highest quality, functionality and style in apparel.